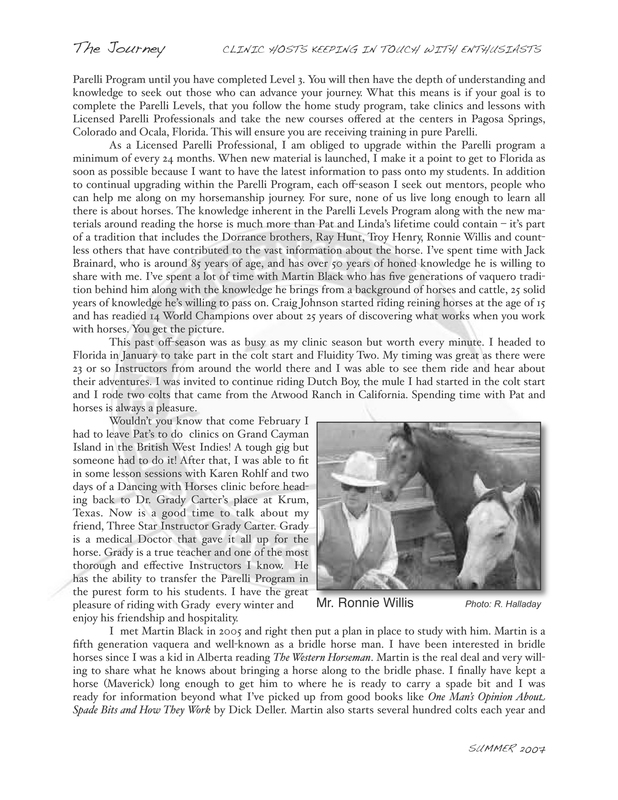 The Horseman’s Word…Our Ranch and Passion! With Spring upon us, we cannot help but reflect upon where we have come from and where we are going. Spring is a time for renewal, for new-growth, rejuvenation, new beginnings and a time when passion awakens. 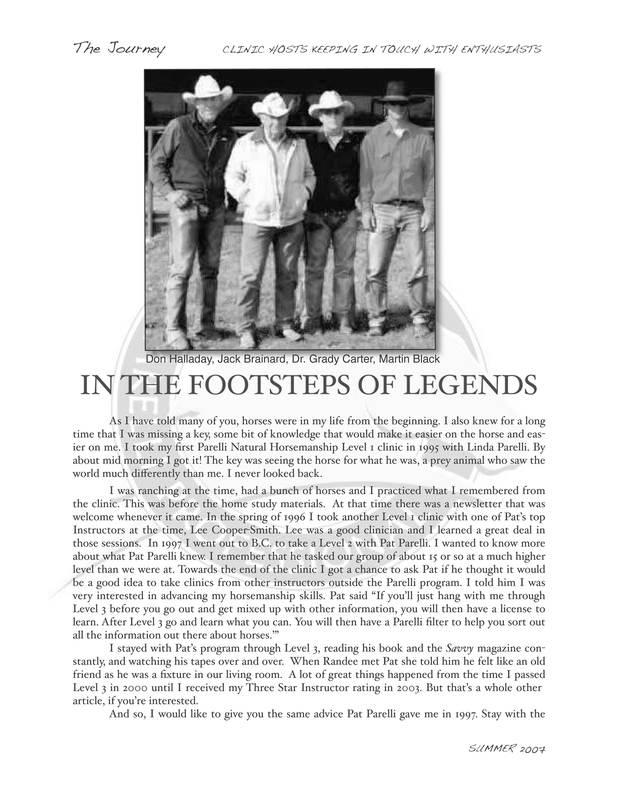 With this in mind, we thought we would share a little about a time at the beginning of our journey when we named our ranch. Not only to revisit where we have been, but also so we are reminded and can share where we are going. Our ranch is our greatest passion and we are so proud to share it with all of our students and to provide a place where students can experience incredible opportunities for education, horsemanship development, and community. 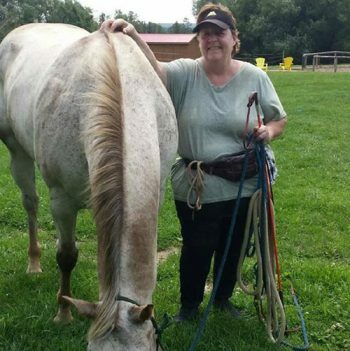 When Maureen and I pursued our education with horses, we sought to learn all we could about horses and looked to improve the quality of our time with horses. We wanted to improve our overall skills and advance our education. That is when we were extremely inspired by the Parelli program. The passion it brought to our lives was unprecedented and we wanted the name of our ranch to reflect that passion and the importance of the relationship with the horse that is the foundation of Parelli. This led us to discovering “The Horseman’s Word” and the meaning that it so richly conveys. Its’ meaning symbolizes all that we teach our students and our unwavering passion for building strong relationships, with both humans and horses. “The Horseman’s Word” was a society of horsemen–“horse-whisperers”–who were known as men who who knew and passed on the secret of quickly developing or training wild horses by bonding with them by earning their trust, rather than using brute force. The Horseman’s Word flourished in the 18th and 19th century and was established in North Eastern Scotland. 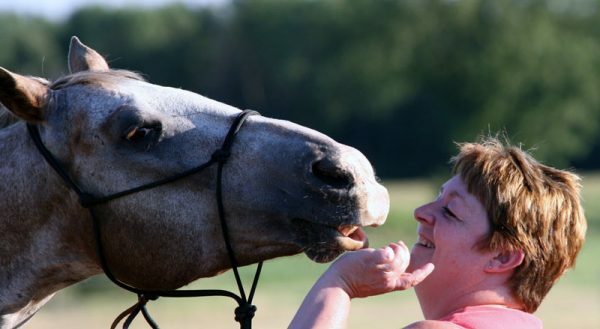 There were several key phrases that group members used to describe how they built relationships with horses, one of those key phrases included “two in one”. In Scots it’s “twa-in-yin” and is a phrase that was said to hold magic qualities and sum up the idea that horse and man worked together as a unit rather than as master and beast. 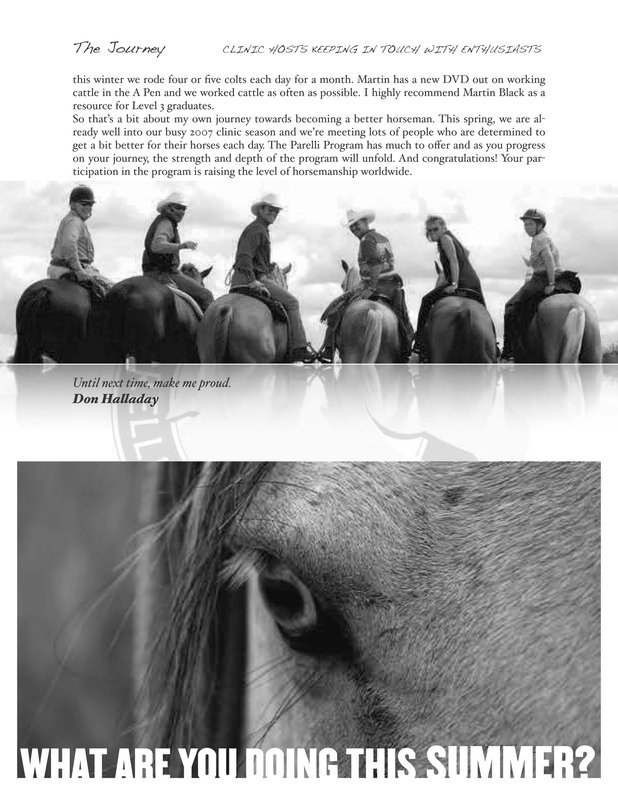 The idea of two becoming one resonated with us, as that is also the essence of the foundation of the Parelli program – helping horse and rider to build harmony, trust and partnership; human and horse coming together in one relationship. Today, this idea still inspires us as we continue to create an environment on our ranch that provides many opportunities for anyone wishing to tap into the power of the Parelli Natural Horsemanship program so they can achieve a magic relationship with their horse. A holiday in Russell, Manitoba in November is sure to get you into trouble. That’s when I first met Bear five years ago. A handsome black foundation Tennessee Walking Horse. He was a bit high-headed and spooky, and had never been inside a barn or an arena. So of course, as novice horse humans, we bought him. My fault entirely. And I wasn’t even really interested in horses then. We were in Russell at the TW Ranch looking for a horse for my wife, Patricia. Here’s how Bear won me over. Patricia had been studying Parelli with Todd Owens, and I’d watch her often. At the ranch there were games and obstacles set up, and while Patricia was looking at another horse, I thought I’d try the Figure-8 with Bear — I’d seen Patricia do that back home. Well, Bear impressed me by showing me how it was done. At our barn in Uxbridge I watched each lesson Patricia and Bear had with Todd. To be honest, I was a little skeptical about this “Parelli stuff”. I’d ridden quite a bit as a young teenager, and I never did anything like that with a horse. But of course, I didn’t know what I didn’t know. Bear and Patricia made good progress on the ground, but he was a handful in the saddle. And when Patricia found another horse, Bear became mine. And he and I began our journey together. Right brained introvert. Go slow with him. Take the time it takes. Give him a chance to figure it out. These were some of the concepts Todd gave me that helped both Bear and me learn on the ground and in the saddle. One day Todd asked me, “what did you learn from your horse today?” That got me thinking. Had I been paying enough attention to what Bear was saying? So I tried to really listen to him. And our relationship changed almost immediately. He had some definite opinions! And I discovered that he didn’t need me to agree with him. He just wanted to know that I had heard what he had to say. Bear and I have made some significant strides (pardon the pun) over the last three years. He’s become more left brain, quite confident, and curious. We have a great partnership, and he’s willing to try almost anything I ask of him – providing I ask properly! Our success together is largely due to our Parelli training. Todd Owens gave me the tools I needed to start becoming the horseman Bear needed me to be. Don Halladay taught me that it was up to me to know when to use those tools, because, as he always says, “It depends…” Pat Parelli showed me that if I had the will, Bear had the ability. Linda Parelli brought focus to my tool kit, and that Bear appreciates the leadership that focus brings. Most of all, through Parelli, Bear and I have learned to trust each other. And trust is what makes a great partnership. Jim Applebaum started riding 5 years ago, at age 65. His horse Bear is a 15.3 15-year-old Foundation Tennessee Walking horse. They are working on their Level 3 Parelli skills. One of the things that we always hear is how much the Parelli Natural Horsemanship Program not only makes a positive impact on the lives of horses, humans and their relationship with each other, but that it also enables the human to create positive changes within their own lives. The principles and philosophies of the program very much lend themselves to personal growth and development. We have found this link to be present not only within the individual personal lives of our students, but also within their professional lives. One of the greatest examples of this connection can be seen in a workshop that we ran for the York Region District 16 OSSTF branch of Educators who work for the York Region District School board. This was a unique opportunity that presented itself to us, as we were able to create and facilitate a workshop that applied to professional development in a corporate setting. Our workshop, titled “Horses: Experience The Truth about Body Language and Personal Development”, provided educators with the opportunity to explore a variety of strategies, knowledge and interactions, between both human and horse, that enhanced their understanding about the power of body language, and how it has an impact on all relationships and interactions with others. 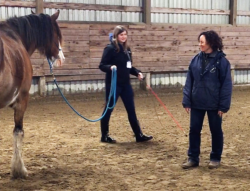 During the workshop the educators learned about and applied the principles of horsemanship and their understanding specifically to themselves, their lives and their classrooms, while also sharing their own experiences with each other within a variety of scenarios. The pedagogy encompassed the use of equine psychology, simulation, guided discussions and the opportunity to work in-hand with horses. 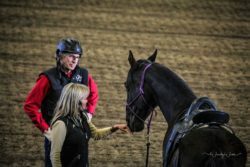 The participants learned how to use their body language to communicate with the horses while learning how this understanding can enhance every relationship in their lives, particularly those in the classroom and the workplace. All of the content within the activities and discussion was then drawn back to their daily lives, teaching practice and how they could enhance their communication skills, particularly when interacting with students and colleagues. There was no horse experience necessary for those who signed up to attend and for many it was an eye-opening and fascinating experience to have the opportunity to be around horses and interact with them. 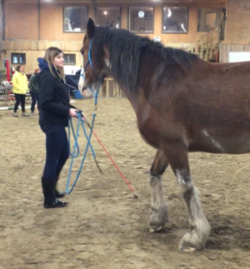 The participants also discovered that by understanding horse behavior they could make connections that would enhance their professional practice and own lives as well. For many, it was even their first time around horses!!! This workshop was fun to facilitate and we thoroughly enjoyed the process of creating, teaching and learning along with the participants. This was a unique experience for us at The Horseman’s Word Ranch and we look forward to having future opportunities to bring our program to the workplace. 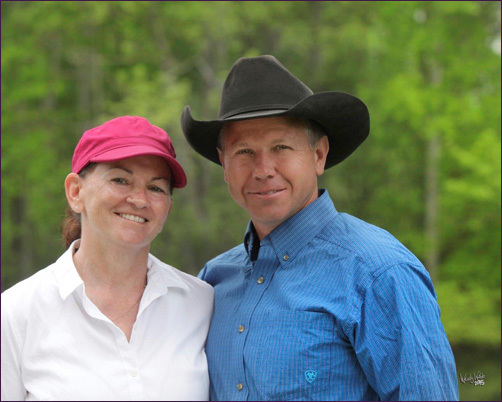 Todd Owens is a 3 Star Parelli Professional and Maureen Owens is a 2 Star Parelli Professional. 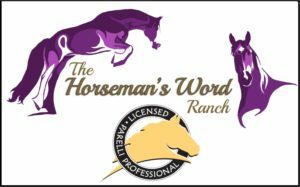 They have a wonderful facility in Uxbridge, Ontario, Canada (just a bit north of Toronto) call the Horseman’s World Ranch. During the month of July, for the past couple of years, they offer what they call “Deep Practice” weeks. 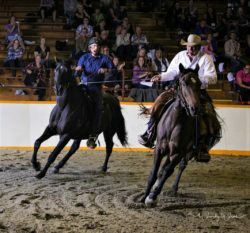 The idea is that you can have a local, scaled-down version of the Parelli Campus experience, right here in Ontario, Canada. You can sign up for from one week to the entire month of July. This is an opportunity to spend quality time working on improving your horsemanship and your relationship with your equine partner and devote as much time as you want during your stay to developing your horsemanship. I first heard about this only last year from another Parelli student who had spent several weeks there with her horse – and she raved about what a wonderful time she had. I took the opportunity to sign up for a week this summer, and what an absolutely wonderful learning experience it was. The week includes access to all that the amenities the facility offers plus one private lesson, one group lesson, and one horseless workshop. I decided to take advantage of having two Parelli Professionals available and signed up for an additional three private lessons. The week also includes the opportunity to ride and play with your horse alongside Todd and Maureen while they play with their own horses, and to watch other student lessons. They have a marvelous facility with a great large outside arena, round corral, honeycomb, all the obstacles you could ever want to play with, and lots of grazing space for spending undemanding time with your horse. They also have a classroom with WiFi available, plus lots of educational DVD’s, should the weather not be cooperative at any time during your stay. The paddock my mare Derby was in was great – in a nice shaded area with a run-in shelter and just a bit of grass for her to snack on. She settled in very nicely right away. An added unexpected bonus that I didn’t anticipate was that since she was away from her normal herd, we were a herd of two for the week and she nickered at me and came up to the gate each time I went to get her for a play session or even just to feed her or clean out her paddock. She came to the gate with a “pick me” expression on her face and this has continued now that we are home and she is back with her buddies. They have facilities for camping (both tent and trailer) on site. There are also a few bed and breakfast facilities nearby if you want that option. I chose to camp out for the week – the first time in many years that I have slept in a tent. They have set up a fun outdoor “cowboy shower” right beside the outdoor horse washing stall in one of the paddocks where their horses hang out. It was a very common site to see horses hooves walking past while I was in the shower – what fun! The learning during the week was absolutely wonderful. The three of us sat down at the beginning of the week to talk over my goals for the week and what challenges I might be having, and worked out a plan to achieve the goals and work on my challenges. I had a ton of BFO’s and gained a deeper understanding of so many things. The power of letting my RBI mare “soak” and process when we successfully completed a task and saw an improvement – I wasn’t giving her nearly enough soak time. I’ve never seen my mare lick and chew and process as much as I did that week. The power of having a clear focus and intent BEFORE I asked my horse to do something. The importance of sticking with a task until I got a change or improvement – even if it was a small one. The importance of having a plan in mind when going to play with your horse, but also the importance of being willing to amend the plan, depending on the horse that has showed up for each particular session. One of my very favourite experiences was one evening when Todd, Maureen and I all took turns playing with our horses in their round corral. We each had a specific task we were working on that evening. It was absolutely fascinating to see the progress from one session to the next for all three of our horses. And having all three of us taking turns in the round corral gave our horses time to soak on what we had just been playing with, so the next turn in the round corral saw great progress from the one before. It was fascinating watching both Todd and Maureen play with their different horses with different horsenalities during the course of the week and how they changed how they approached each horse, according to their needs. Todd was working on improving a specific task with one particular horse over the course of the week. It was so very interesting watching the different things he would do to attempt to get the result, response, and understanding on the horse’s part and achieve the goal he was looking for from the gelding he was playing with. I was so thrilled that I was able to see the progress from one day to the next and to witness how the horse finally figured out the puzzle and how impactful that was for the horse. Todd and Maureen both are so very generous with their time and knowledge and passion for horsemanship and the Parelli program. They live the principals of the Parelli program all day, every day in all aspects of their interactions with their horses and student’s horses. I will definitely come back next year, hopefully for 2 weeks this time. I will also be bringing a couple of friends so they can also have this amazing experience. In 2005 I started at zero with the Parelli program. Brand new to horses, I had not been on a horse for more than a few minutes since I was a kid and, even then, only for a few hours. I was as green with horses as you may be. Within days of owning horses my wife, Maureen, purchased the whole ‘Enchilada’ of the Parelli Natural Horsemanship education and equipment. I confess I was beside myself at the cost of, or the need for, this material. What I didn’t realize was the incredible investment that had been made, an investment that would change our lives forever. We studied the Home Study program enthusiastically, developed savvy and absorbed the Love, Language and Leadership program. With technology advancement Parelli now offers the Parelli Savvy Club as an affordable pathway to ‘get started’. In 2009 Shania and I became official Level 3 graduates of the Parelli Program. We continue to be progressive playing in Level 4, headed towards our Level 4 auditions; trying to be just a bit better horseman for my horse every day. In 2011 we completed Level 4 of the program and are now studying in Level 5 and 6! How should you get started? From the spring of 2007 through to the fall of 2009, Maureen and I had hosted 51 clinic days for Don Halladay. Hosting clinics has provided ever-developing exposure to Parelli education, both theory and practice. I have observed and experienced, hands-on, the excellence in teaching and horsemanship that is required and expected of a Parelli Professional. 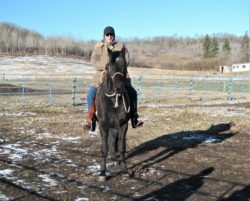 My clinic exposure has been very valuable in my own horsemanship progression and my understanding for what can be expected of a career as a Parelli professional. I appreciate and respect the eight principles of Natural Horsemanship. They have been, and will continue to be, instrumental as I continue my journey. I wish to thank Pat and Linda Parelli for their horsemanship program, and my mentor, Don Halladay, who has been an excellent educator, horseman and ambassador of the program. My journey with horses began on December 25th, 2004 when my husband, Todd, bought me my first horse, Strawberry, for Christmas. I quickly figured out that I did not know much about horses and found that if you ask 10 people the same horse question, you get 10 different answers. And so my search for answers pointed me to Parelli. I bought the “full enchilada”, (as my husband would say), in the fall of 2005 and I have not looked back. I had the right attitude coming into the program and Parelli has provided me with the knowledge and tools that I need to be effective. 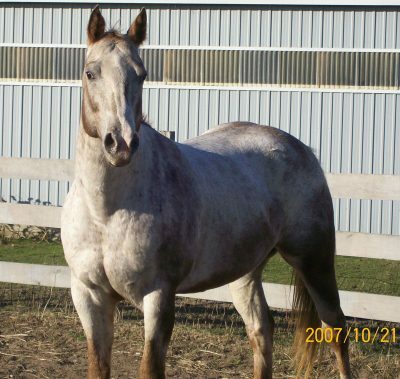 It established both the basic skills required in natural horsemanship and a wonderful education in understanding our horses, especially as a new horse person. Through the home study and clinics, I have since developed the techniques required to accelerate my growth in Parelli. With time, imagination and support, I have accomplished Level 4 with my partner Shiitief and we are currently pursuing higher learning in the sport of Dressage. I am very excited to be a Parelli Professional, Two Star Parelli Instructor and to do my part to make the world a better place for horses and humans. Copyright @ 2010-2019 Todd & Maureen Owens, All Rights Reserved.